The March 2019 issue of Breathe now features four online exclusive articles. They include a review on over- and under-diagnosis in asthma and the latest article in the series focusing on myths and maxims in respiratory medicine. Find out the thread topics for future issues of Breathe. Registration for the 2019 ERS HERMES examinations in adult or paediatric respiratory medicine is now open – offering an opportunity for healthcare professionals of all levels to measure their knowledge against European standards. The current issue of Breathe focuses on over- and underdiagnosis and over- and undertreatment in respiratory diseases. It includes reviews on under- and over-diagnosis of COPD across the world and on whether a strategy of aggressive management of solitary pulmonary nodules pay off. Read the introductory editorial from Chief Editor Claudia Dobler. 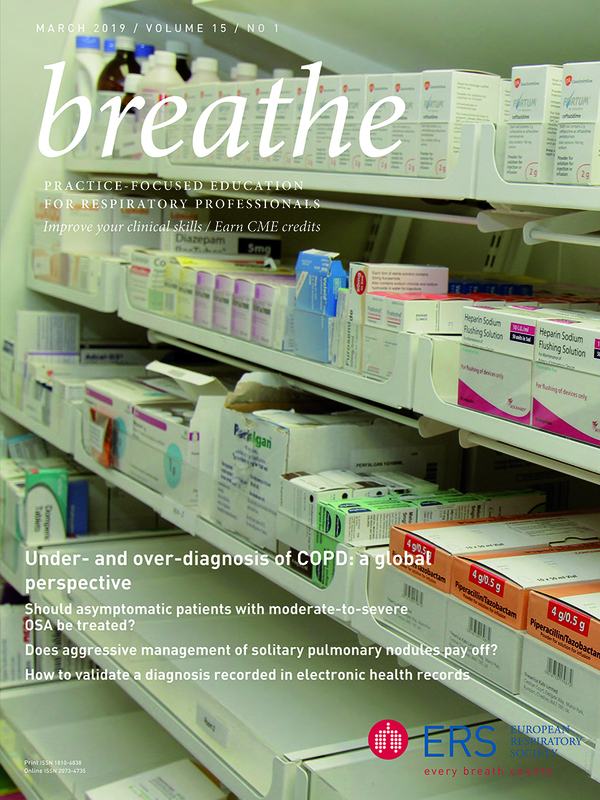 This issue of Breathe also includes a pro/con debate on the treatment of asymptomatic patients with moderate-to-severe OSA and a lung function corner article focusing on clinical interpretation of transfer coefficient of the lung for carbon monoxide and accessible alveolar volume.